March 15, 2009 - Over the past 24 hours Keith and your webmaster had an exchange of emails (below, minor edits) regarding his purchase of Cat's Paws. 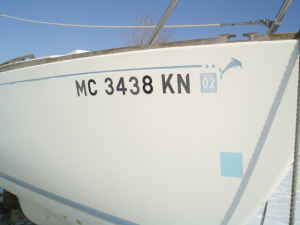 We first found out about this boat when she appeared on CraigsList/Toledo in early February. That ad appears below. She is believed to have sailed out of Crescent Sailing Yacht Club in Grosse Point, Michigan (Confirmed). 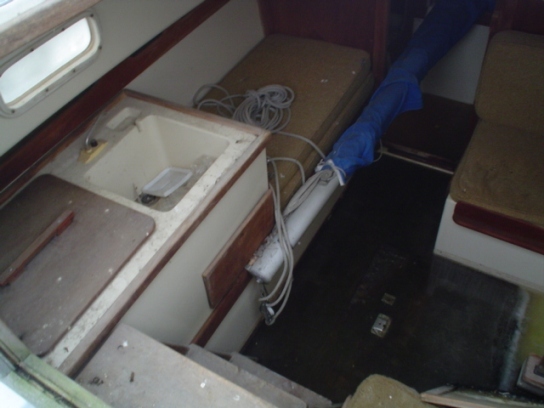 Keith has also sent in some 'Before Photos" that are below. This space is reserved for an "After" photo of Cat's Paws - in the meantime this one will have to do. Welcome aboard. You have already joined. All you have to do keep us posted on Cat's Paws new life. When you get a chance send us more pictures so we have a before and after story about her restoration. Cruise around the website and you will find a lot of useful information. You can email me any questions and I'll do the best I can to answer. Regarding history, I have no information except I think she sailed out of the Crescent Sailing YC in Grosse Point - I have tried to get info from them but no luck so far. The Michigan registration # may be a way to get prior owners but you need a 'friend' in the Michigan system to get the info - or maybe a friend in the Indiana dept. Where do you plan to sail her? Thanks for the prompt reply. I'm Keith Gross, 50 year old ex-marine. Got hooked on sailboats after visiting the Med ports a few times with Uncle Sam. 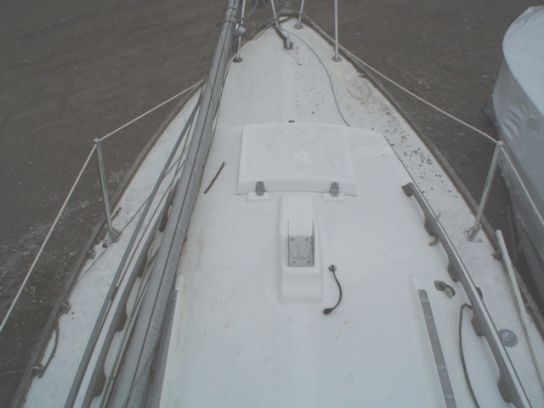 Started sailing in an old 10' O'Day Snark, 5-6 years ago. Two years ago I started crewing on an O'Day 25, and got hooked! I bought an O'Day Daysailer last year and learned to singlehand. I have a 26' limit on Eagle Creek Reservoir, here in Indianapolis. 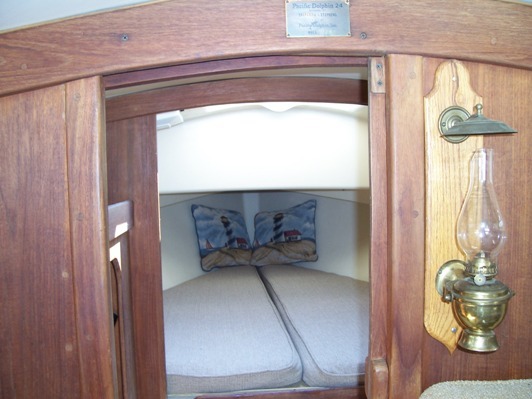 I have been looking for something without an ugly kicker hanging off the back, an actual head, and a galley. Enter Cat's Paw's. I have a limited budget and have been bargain hunting for over a year. 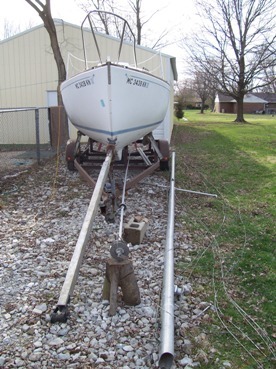 I have looked at dozens of boats 21'-26', on a trailer - a needed evil for land-locked sailors. This one is in remarkably good shape. The only dry boat I looked at. I haven't brought her home yet, they have to rework the bunks on the trailer. When I get her home next weekend, I'll get some "Before" pictures posted. March 23, 2009 - We received the following email from Keith. I made the trip home from Detroit with Cat's Paws. Uneventful & boring, great trip! Spent today unloading and cleaning. Found a nice compass,a working jib (8' foot), a 150 Hood genny, if the bag is to be believed (14' foot), both roller furlers, and a spare, full batten ,high roach main, with 2 reefs. I haven't undone the main cover to see what's on the boom yet. 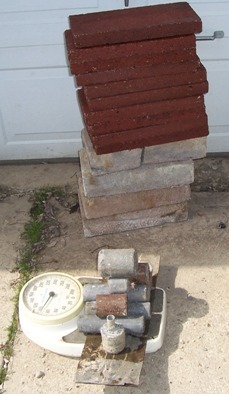 When I pumped-out the bilge I found 375 pounds of cement blocks under the sole. I also found 95# of lead in the forward vee-berth locker. (see pictures). The Westerbeke turns over. 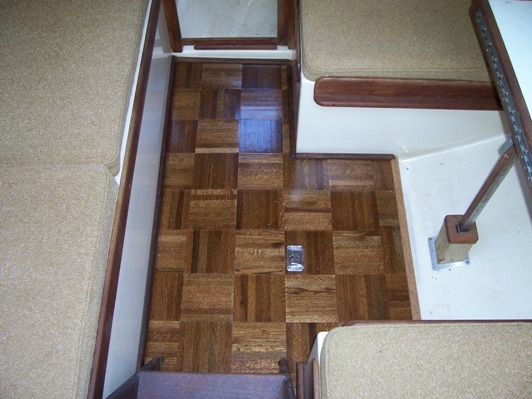 Pressure washed the decks and cockpit, scrubbed A LOT of teak. Moved out the wasps, mud-dabbers, birds and snake (it was only a skin.). Now it's clean enough to really start cleaning. Here be the pictures that sent me to Detroit. More when we get here back to home port.
" Finished round one of clean-up. Pressure washed every square inch of the exterior. The water running off her looked like milk from all the oxidation. When I blasted the teak, the water ran green. 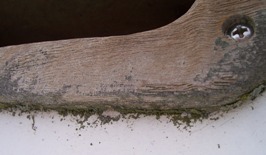 What is that stuff that grows on teak? My wife Linda laundered the cabin cushion covers, I had to replace a rusted zipper on the large, dinette cushion, but they cleaned-up well. We ordered the material for the new v-birth covers. 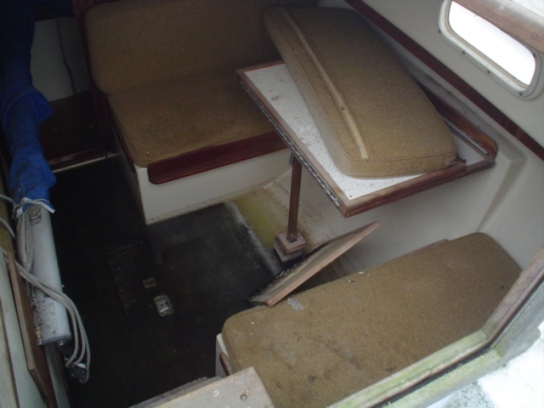 Initial clean-up of cabin complete. Cat's Paws has been made whole, we could actually sail now. I need to get a new battery and see if the Westerbeke can be brought back to life. Then on to sanding the fairing compound smooth, and painting the bottom. More as it unfolds. We found a 1994 1 ton Dodge van for a tow vehicle. Here's the best part, I did some trading and got the running van for only $100. It's not pretty, but it's stout. It runs on Natural Gas and the old owner was tired of driving to the other side of Indy to fill up. Also, I have the mock-up of the mast raising system started, I'm waiting for a mast support I bought to arrive so I can get some final numbers. Still haven't started the bright work yet, or the bottom. The more we get done, the more we find to do. Brisk winds and fair weather to all. 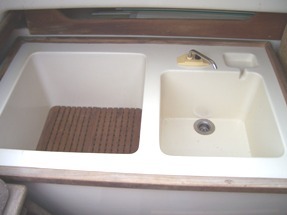 The sliding galley cleaned up well, still need to wash the teak. The ice-box lid is a very tight fit, annoying to say the least. I'm hesitant to sand on it though. 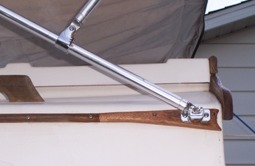 I had to rebed the screws on the dinette table hinge, and make a new jack-post for the leg. It tightened-up and cleaned-up well. I made a plywood lid for my water tank, don't know where I'd find the proper lid. 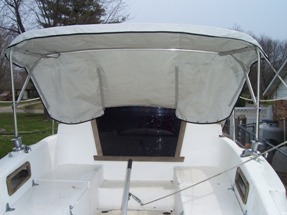 I think I'll get a Plastimo bow tank to put in the forward storage compartment. Ps Update: Re: The stuck points on the Westerbeke. I have cleaned them, and they should work, trying to find a spare set before I put them back in. I went to the license branch and picked up the paperwork to start the legal process. I've been away for a few months, just got back to work on Cats Paws these past couple of weeks. The engine runs, I got the original points working, installed a new condenser, and Presto! 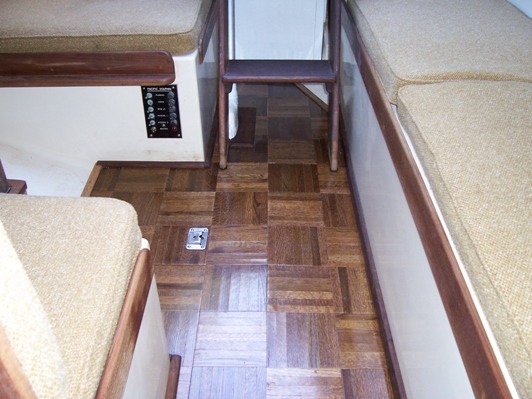 I just finished the sole with new oak parquet, all interior wood refinished. Still waiting on the state to get legal so we can get to the lake. The new trailer is almost ready - I found a tandem axle trailer with surge brakes ($600), I thought it would be safer and pull better.. I hope to have some on the water pictures soon. ps About that lamp... it was actually the first piece of my Dolphin I owned. My father liked to do woodworking after he retired. He made hope chests, shelves, tables, etc. About a year berofe he passed, it was about 1995, he gave me that lamp. 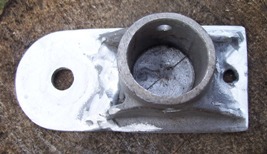 He found it at a yard sale and made the mounting plate for it. When he gave it to me, I didn't even know what it was. He told me it was a ships lamp and said; "You're going to need that some day." 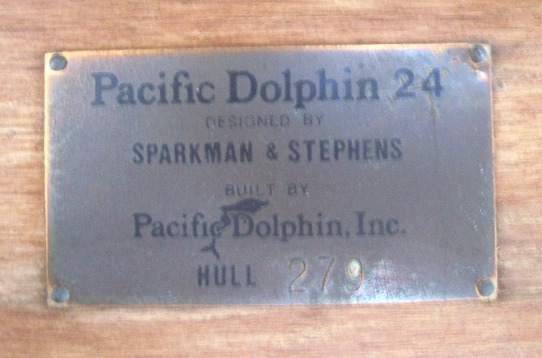 I've had it out in the garage for years.Then I saw some like it on some of the Dolphins on the site. 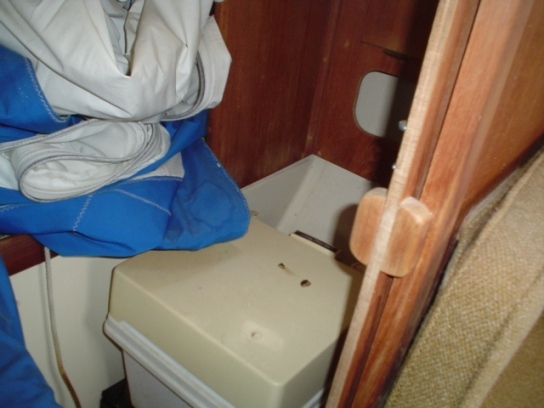 Now it resides proudly in Cats Paws cabin, a small piece of my father will always be sailing on my boat. Webmaster Note: Keith's lamp is a Weems and Plath "Atlantic" gimbaled lamp, model # 718. 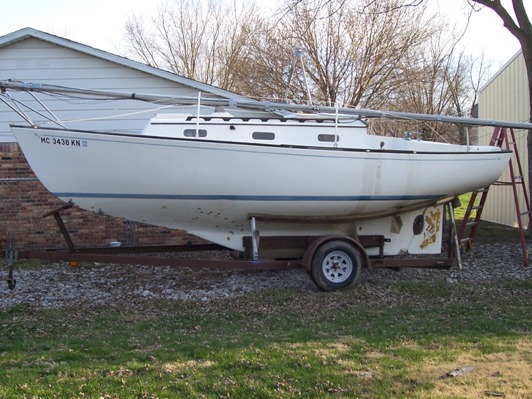 I had one just like it on a previous sailboat that I sold with the boat in 1983 - I tried to keep it but the buyer wanted it. When I bought Marionette in 1995 I went looking for this same lamp in second hand marine stores but could not find one.Too cheap to pay then $120 or so for a new one, I found a Den Haas Gimbaled Cabin lamp for $35, usually over $200 new. It had the advantage of that fat base so on calm days you could put it on the table. I just got off the phone with Cats Paws original owner. I found an old Michigan registration and called him. His name is Nils - he's 92 years young. 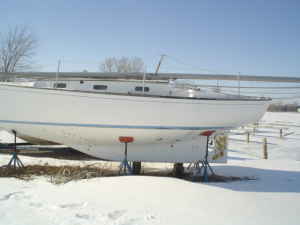 He ordered the boat new in 1977 and sailed it until the end of the 2002 season. He then donated the boat to a missing children's fund. He regularly raced with the Detroit River Yachting Assoc. on Sunday's and Wednesday's. He sailed out of the Crescent Sailing Yacht Club on Lake St. Clair, north of Detroit, where he kept her on a buoy during sailing season. 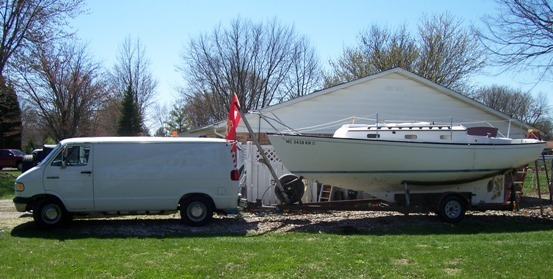 He was very surprised to hear from me about his old boat. We talked for the best part of an hour. I thanked him for taking such good care of her. He said " I hope you enjoy her as much as my wife and I did." He still has a picture of his wife Jean at the tiller. November 28, 2009. 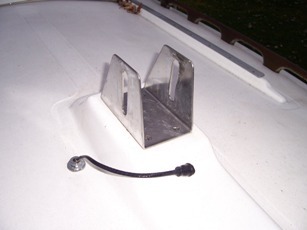 Keith sent in some photos and and an email regarding Cats Paws' mast hinge which has been incorporated in the Technical Section on Mast Tabernacles/Hinge Plates. Click to go there. 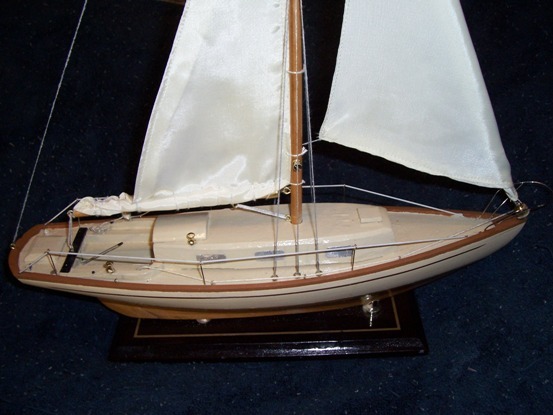 Keith sent in a couple of emails regarding his efforts to 'Dolphinize' a ships model into a Cats Paws model. This is an ongoing project. The picture at left was the initial effort. 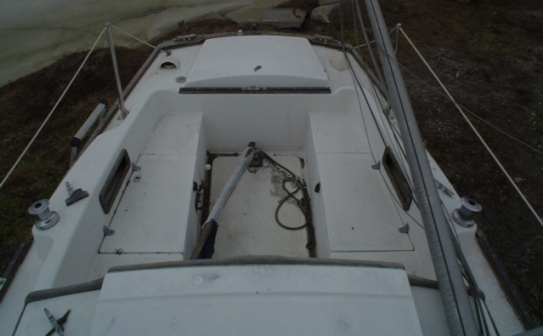 Below is the latest interation including life lines, jib furling, reefed and ready to go - emails consolidated and minor edits. I couldn't leave the model alone. It was so close, but so many little things were off. The boom and the main just weren't the right size. So..., I tried to copy Cats Paws layout on the rigging. 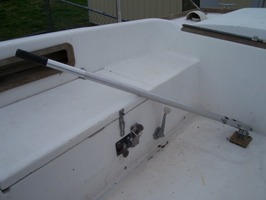 I added a back stay, centerboard winch line, roller furler, vang, masthead fitting and lite, mainsheet traveler, jib leads, halyard winches, toe rail, lifelines, and a bow pulpit. 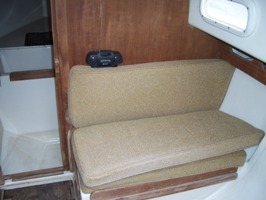 I also reshaped the front of the cabin and the transom. I wish the real thing was as cheap and easy to refit!